Warm and dry indoor air dries out your nasal and sinus passages putting you more at risk of getting sick this time of the year. Photo by Mcfarlandmo via Wikimedia Commons. Do you feel like you’re more susceptible to colds, the flu, allergies, and sinus infections this time of year, even though you know you’re doing everything in your power to keep your immune system strong? Can’t quite figure out why you keep getting sick? The culprit may be due to living in a warm dry environment due to indoor air heating. Now that we’re in the thick of winter, everyone seems to have the heat running full blast to keep warm, which undoubtedly leaves you feeling toasty all over, but it sure does a job on your nasal and sinus passages. You’re left feeling like you just spent a month in the Mohave Desert. Parched and not quite functioning at your best, the lack of moisture throws your delicate respiratory system out of balance, leaving your more open to health problems. Because your nasal cavity is one of your body’s natural protective barriers and first line of defense, keeping it soothed and lubricated is key. Otherwise, if it’s too dry, your mucous can become much thicker, resulting in your nose being unable to cope effectively with sweeping away bacteria, dust, and other allergens. In other words, one of your barriers to being healthy and fighting off sickness is compromised. Therefore, germs and allergens can take hold, causing your mucous membranes to become inflamed and congested. You then start feeling sick and downright miserable. You might even just have sinus pain and pressure. 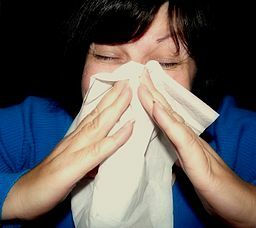 If it continues for too long, a sinus infection may develop. And in some cases, you might even get an ear infection since too much thick mucous may create a back-up. One of you first thoughts might be to reach for over-the-counter decongestants, but they often make things worse if you don’t take steps to counter their negative effects. While helping decongest you, they also dry out your nasal passages even more. And so a vicious cycle may begin. You might not be able to kick what’s making you sick. Why? Your body is still dry and imbalanced and trying to compensate, because you haven’t gotten to the root cause of the problem — the fact your nasal passages are dried out and that they need more moisture to flush out what’s ailing you. Until you fix that, you’ve got problems. But how? In addition to staying well hydrated by drinking lots of water and soothing herbal teas and staying away from things that dehydrate you (e.g., alcohol), there are a few simple changes and really effective, at-home remedies that you can do to re-moisturize and soothe your nasal and sinus passages. Check out what they are in my upcoming blog post and keep clear of allergy symptoms, colds, and more for the duration of this winter! “Your Nose: The Ultimate Air Cleaner | Allergy and Asthma Network Mothers of Asthmatics.” Allergy and Asthma Network Mothers of Asthmatics RSS. N.p., 4 Feb. 2009. Web. 21 Feb. 2015. Copyright © Karen Peltier and Well Gal, 2012-2015. All rights reserved. ← Treat Your Sweetheart to a DIY At-Home Spa Day for Valentine’s Day! That’s interesting. I live in Las Vegas, so we rarely run the heater, but the air is dry year round. I seem to have developed an immunity to the negative symptoms you describe, though, because I’m healthy as an ox. Zach recently posted…What Do Attorneys Do? So glad to hear you’ve had no problems living in the desert and all is well with your health! Sounds like your body has adapted pretty well. For many of us, I think the issues with the dry heat come on if we’re used to humidity and moisture and all of a sudden we’re exposed to dryness and heat, which happens with indoor heating or even a trip to a hot, arid climate. The change is sometimes too much and throws us out of balance, leaving us more susceptible to getting sick. I think this is exactly what happened to my daughter recently. We took a trip to Phoenix and once we arrived she began to not feel well. She started getting nosebleeds, suffering from dry skin, and just felt off. But as soon as we returned home (to more humidity and coolness), she was fine. Dryness from furnace heating is a perpetual problem for us, here in northern Alberta, Canada. Our winters are so long that we have the furnace going for as many as 8 months a year. Of course, it doesn’t help that our home is 35 years old and we have 5 cats and a dog, I’m looking forward to reading your suggestions and see if they’d work for us. When I was a child I lived in a climate that required the heat to be running close to three-quarters of the year as well, so I know what that’s like. I think it’s really what contributed to my earaches and sinus issues as a kid all the way into my early adult years. Now that spring is here, hopefully a month with no heating required is right around the corner for you! To read about some of my suggestions to deal with dry indoor heat that wreaks havoc on your sinuses, nasal, and bronchial passages, check out this post.